The EDER Titan 80 ratchet felling wedge is a revolutionary aid to felling large trees. It has a lift capacity of 25tons. 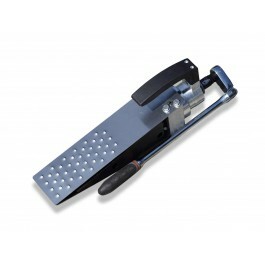 It is an alternative to the traditional hammer and wedges and is more efficient and safer to use. The wedge can exert a force of 25 tons and is much easier on the operator requiring very little physical effort to operate. It is also safer as you are less likely to shake dead limbs from the tree as you can when hammering in wedges. At only 5.6kg the Titan 80 is small enough and light enough to carry on to site easily so it is always available should you need it to assist when felling a tree.